I have an ongoing series of posts here at Prairie Rim Images in which I highlight many of the older, manual focus lenses which I love to use. Because these are relatively small subjects, many of the photos that I take of these lenses can be made in a simple, table top studio made of parts scrounged from around my house and lit with only a single light source. Many of you know that I like old things, and that includes camera lenses. I love using inexpensive, old, manual-focus glass on my new DSLR bodies. This is the second in an ongoing series of posts in which I highlight one of these old beauties. This time, the spotlight is on my Yashica ML 75-150mm f/4 zoom lens. It's an uncommon and inexpensive lens, even my my standards, but it still gets lots of use. Next Sunday marks the tenth anniversary of the airborne attacks on the World Trade Center in New York City, the Pentagon in Washington, and the downed United Flight 93 in Shanksville, Pennsylvania. 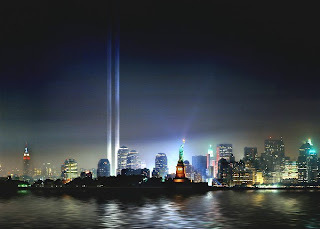 11 Sept 2001 was a day that few American adults will ever forget. I'd wager that everybody you meet on the street could tell you exactly where they were when they first heard of the 9-11 attacks.